The second day of the state girls swimming and diving championships are underway at the King County Aquatic Center in Federal Way. The Class 2A meet is underway and top qualifier Port Angeles won the 200-yard medley relay with a hard charge from Liberty, 1:50.76 to 1:51.31. Port Townsend was named the academic champion with a team grade point average of 3.508 for 1A and head coach Peter Braden. 200 freestyle final: Klahowya junior Kira Crane placed fifth in 1:57.39 and North Kitsap’s Isabel Hendryx was sixth in 1:59.90. 200 IM consolation final: Olympic sophomore Chloe Partsch finished 10th overall in 2:16.82, well ahead of her prelim time of 2:20.54 from Friday. 50 free final: North Kitsap freshman Eleanor Beers won her first state title in the 50 freestyle in 23.36. That’s the second fastest all-time in 2A and she tied with Missy McIntyre of Oak Harbor for the top 10 all-time. 100 butterfly final: Klahowya’s Crane finished second to Alexis Schmidtt of Cheney, 58.21 to 58.24. Partsch of Olympic was sixth. 100 free final: Beers claimed her second individual title with a time of 50.98, a state record by one-one hundredth of a second. Amelia Messegee held the record of 50.99 since Nov. 10, 2007. 500 free final: Kingston’s Claudia Velie finished fifth. 200 free relay final: Liberty edged North Kitsap to win the relay, 1:39.45 to 1:39.84. 100 backstroke final: North’s Isabel Hendryx finished second to two-time state champion Taylor McCoy of Pullman. McCoy will swim at WSU next year. Hendryx’s had a time of 59.58 to McCoy’s 56.40. 400 free relay: North Kitsap won in a time of 3:14.36, holding off Liberty in 3:14.71. North Kitsap finished fourth overall. It’s the first Greg Braun-led Vikings team to podium at the state meet in his 26 years as head coach. Bainbridge senior Zora Opalka receives her gold medal from Spartans head coach Sarah Bullock at the Class 3A state swimming and diving meet. Opalka is the first female diver to win a state championship for Bainbridge. 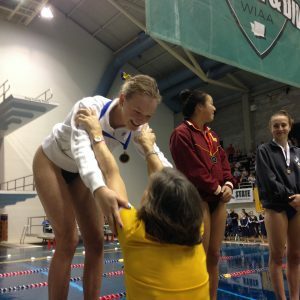 1-meter diving: Bainbridge’s Zora Opalka won the school’s first girls title with 422.10 points to hold off Lakeside’s Amber Chong, 421.70. Bainbridge’s Cammy Rouser was fifth. 200 IM final: Central Kitsap sophomore Taylor Sims placed eighth in 2:14.03. The North Kitsap 200 freestyle and 400 freestyle relays are ranked No. 1 heading into the Class 2A state swimming and diving championships this week at the King County Aquatic Center. The 200 free relay, which won the West Central District title last weekend, set a district record in 1 minute, 40.54 seconds. The winning relay included Isabel Hendryx, Dannica Hennings, Izy Iral and Eleanor Beers. NK coach Greg Braun uses the same lineup for the 400. It was also during the district meet that NK set four school records, and three meet records, on the first day and then five school records and five meet records the second day. 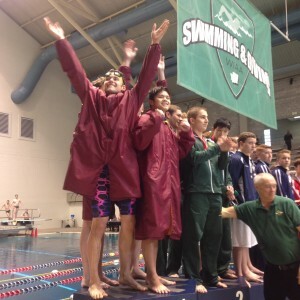 Swim dad RJ Iral put together a great little video of the relay win. Bonus: I’ve mentioned the name Eleanor Beers before on The Blogstroke, as an age grouper, but this will be her first high school state finals. Beers, a freshman from North Kitsap, anchored both relays for the Vikings at district and then just destroyed the field in the 100 freestyle (which you can watch here). Will be fun to see what she can do Friday and hopefully Saturday. A veteran and rookie are among the top seeds heading into the Class 2A West Central District swimming and diving championships on Saturday. Klahowya senior Kira Crane earned the No. 1 spot after Friday’s preliminaries at Hazen HS in the 200-yard freestyle in 2 minutes, 0.27 seconds and the 100 butterfly in 1:00.59. NK’s Isabel Hendryx is seeded second in the 200 free. Olympic’s Danielle Snyder is seeded fourth in the 200 and in the 500 free. North Kitasp freshman Eleanor Beers is the top seed in the 50 free, 24.17 seconds, and in the 100 free, 52.60. Both are meet records. NK’s Dannica Hennings is seeded fifth in the 50 free. NK’s Isabel Hendryx will be looking for a district title in the 100 backstroke after touching the wall in 1:00.16. Kingston’s Claudia Velie has the top seed in the 500 freestyle, 5:33.04. She is also seeded fourth in the 200 IM. North Kitsap’s 200 free relay is the top seed, 1:41.29, as is its 400 free relay in 3:44.52. Olympic’s 200 medley relay, and Klahowya’s medley are seeded third and fifth, respectively. The meet continues Saturday at 11 a.m. There MUST be something in the water at North Kitsap’s pool, right? Last week Kingston sophomore Claudia Velie (the Buccaneers practice/hold meets at the NK district pool) secured her seventh state qualifying time for the Class 2A meet and now holds every individual school record. Well lookout Kitsap swim fans, here comes Eleanor Beers. Beers, a freshman, is a late comer to the high school swimming scene. She wasn’t sure she wanted to swim the prep season but then decided in favor and NK coach Greg Braun couldn’t be more pleased. Beers has been an outstanding age-grouper for many years (she’s been mentioned plenty of times on The Blogstroke) and now it seems Beers is poised to make her mark in high school. In two meets, Beers has already set three school records — the 50 and 100 freestyles in a meet against Port Angeles on Sept. 22 — and then against Kingston on Sept. 29. Beers broke a 31-year-old record in the 200 individual medley held by Michelle Arnold in 1985. Beers has state-qualifying times in the 50, 100, 200 IM and 100 backstroke. Other state qualifiers for North include Isabel Hendryx in the 200 free, 200 IM, 50 free, 100 butterfly, 100 free and 100 backstroke. Izy Iral has qualified in the 50 free, 100 fly and 100 back. All three Viking relays have qualified with the 200 medley including Hendryx, Claire Stone, Iral and Dannica Hennings. The 200 and 400 free relays include Hendryx, Iral, Hennings and Beers. Kingston sophomore Claudia Velie is close to gaining Ironman status and already owns all individual records at the 2A school. Velie notched her seventh state-qualifying time, and fifth school record of the season, at the Kitsap Swim-vitational last weekend. The lone race she’s missing for Ironman, given to swimmers who qualify for the state meet in all eight individual events, is the 50-yard freestyle. Olympic sophomore Chloe Partsch qualified for the 2A state meet in the 100, 200 and 500 freestyles as well as the 100 butterfly and 200 individual medley. The Trojans’ 200 medley relay also qualified. It didn’t take long for Bri Duchemin to decide where she would like to spend the next four years playing volleyball. The North Kitsap senior made a verbal commitment to Saint Martin’s Univeristy in Lacey in late August. Saint Martin’s is a NCAA Division II school that plays in the Great Northwest Athletic Conference. The 6-foot outside hitter will sign her letter of intent for the Saints during the volleyball signing period in November. Duchemin has been one of the best players in West Sound since her sophomore season. She was named the Olympic League 2A MVP last year and was the Kitsap Sun’s player of the year. And the programs the school offered — biology or teaching. Saint Martin’s hit on all three fronts. “Everything seemed to fit,” Duchemin said, who went to a one-day camp and played with her future teammates. Duchemin said she’d been thinking about what she wanted and decided to make her verbal commitment right away. “There’s no reason to wait,” she said. Now that her college decision has been made, Duchemin feels like it’s lightened her load. “I think the fact that I know where I’m going took a huge stress (off me),” she said. The Vikings (6-1 overall, 5-0 OL) are making a push for their eighth league title and another run to the state tournament. Duchemin has been an integral part of NK’s run to state, helping the Vikings place second in Class 2A in the 2013-14 season. Duchemin this week notched her 1,000 career kill, something she wanted to accomplish this season. She knew she was close heading into Tuesday’s league match with North Mason. Hunter Parini, front, celebrates along with teammates Tim Gallagher, Ethan Fox and Bryce Hoffer, the Bucs’ 200-yard medley relay state championship in the Class 2A meet at KCAC in Federal Way on Saturday. Kingston proved they could walk the walk after all. The Buccaneers earned their first state championship in school history on Saturday when the 200-yard medley relay won the Class 2A event in 1 minute, 43.08 seconds. The boys program split off from North Kitsap in 2008-09 and has been progressing each year. The Bucs won the Olympic League and district meet titles this year, also firsts for the program. The school opened in 2007 and co-oped its swimming program with North Kitsap that first year. It’s been quite a meet so far for the peninsula . Kitsap has been on the medal podium in every event. 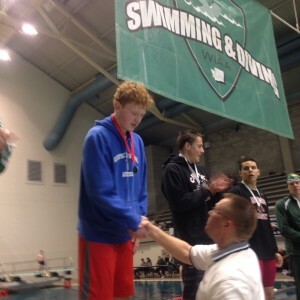 Olympic freshman Ross Burchell receives his second-place medal from Les Schwab representative Lonnie Nunley Saturday for the 200-yard freestyle. Kitsap wound up with three second-place finishers in Olympic’s Ross Burchell, Bremerton’s Nathan Rubie and Kingston’s Tim Gallagher. Burchell finished second in the 200 freestyle in 1:45.86, a personal best and the 500 freestyle in 4:42.39. 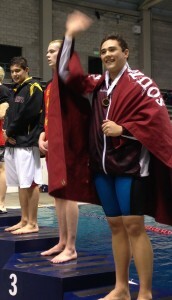 Bremerton’s Rubie finished second in the 100 butterfly. Rubie touched the wall in 52.93, closing in on Elliott Hofferth of Anacortes in the final 10 yards to make it entertaining. Gallagher, a freshman, was second in the 100 backstroke in 53.54. In total, West Sound walked away with 22 medals in 12 events. Kingston finished in fourth place in the team standings, giving the Bucs their first state trophy. North Kitsap placed seventh while Olympic was 12th. Klahowya was 24th and Bremerton 28th. Kingston and North Kitsap celebrated their fourth place and seventh place finishes, respectively, at the Class 2A boys state swimming championships Saturday at KCAC. Bainbridge swimmers celebrate their second-place team finish at the Class 3A boys state swimming and diving championships Saturday at KCAC. The 3A session saw the Bainbridge Spartans earn a second place finish overall with 288 points to Bellevue’s 349.5. It’s the Spartans best finish since 1980, when they also finished second. 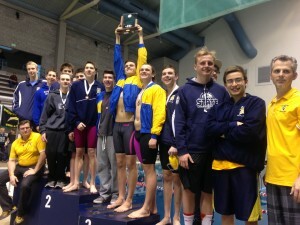 The Spartans’ 200 medley and 200 free relays placed second while the 400 free relay was third. Individually, Garrett Waite had two top four finishes to lead the Spartans. Waite was third in the 200 IM and fourth in the 100 backstroke. Other top finishers for Bainbridge were junior Parker Bushey who finished fifth in the 200 freestyle, freshmen Kevin Houseman, fifth in 200 IM and 100 breaststroke, Makai Ingalls placed sixth in the 100 butterfly and eighth in the 50 free, and Carter Hall was eighth in the breast. The 4A meet is underway and South Kitsap’s Dylan Macabitas, who opened the session by singing the national anthem, placed fourth in the 100 backstroke in 52.67, just off his personal best from prelims (52.28). Macabitas also finished 12th in the 200 freestyle. South Kitsap’s Dylan Macabitas waves to the crowd after receiving his fourth-place medal in the 100-yard backstroke Saturday at the Class 4A state boys swimming and diving championships. South diver Jason Gleason finished seventh in his first meet. He’s a junior and is determined to improve on that ranking next season. The Kingston Buccaneers are off to a hot start at the state Class 2A boys swimming and diving championships Friday morning at the King County Aquatic Center in Federal Way. The Buccaneers won their heat in the 200-yard medley relay in 1:43.22 and are the top seed heading into Saturday’s finals. North Kitsap is seeded seventh in the same event and will get a medal tomorrow. Solid first day for 2A. Kingston qualified all 13 of their swimmers into the finals, a first for coach Mark Van Huis he said. Kingston’s Ethan Fox is seeded fourth in the 200 IM after winning his heat in 2:01.10 while teammate Tim Gallagher is seeded fifth. Gallagher is also eyeing a state title in the 100 backstroke as he is the second seed. Fox is seeded third in the 100 breast. Kingston’s 400 free relay is the third seed. Klahowya’s Mason Heaman is into the finals in the 200 freestyle as the fifth seed. Olympic’s Ross Burchell is seeded fourth in the 200 free, but is the second seed in the 500 free. The Trojans’ 400 free relay is seeded sixth. North Kitsap’s Thor Breitbarth, coming off an illness at last week’s district meet, is seeded fifth in the 50 free and seventh in the 100 free. North’s Nathan Ramey is seeded fifth in the 100 breast and seventh in the 500 free. Bremerton sophomore Nathan Rubie is seeded fourth in the 100 butterfly and he had to race in a swim-off for the 200 IM. He had tied with Chris Kim of Fife and wound up beating Kim in the two-man race to qualify for the consolation finals. Freshmen Garrett Waite is seeded third in the 200 IM and 100 back. Senior Sam Alpaugh is seeded sixth in the backstroke. Freshman Kevin Houseman is the fourth seed in the 100 breast while Carter Hall is seeded seventh. Divers Dylan Garthwaite and Gabe Emert each made the finals as did senior distance freestyler James Bullock. We only had two individual qualifiers from South Kitsap as well as the Wolves’ 200 medley relay. The relay, which consisted of Dylan Macabitas, Giacomo Bressanello, Simon Martin, Matthew Martin, finished in 1:45.35. They did not qualify for the finals. Macabitas qualified fifth in the 100 backstroke and 14th in the 200 free. Diver Jason Gleason is seeded sixth heading into the finals with a score of 253.70 after a strong performance in the prelims and semifinals. Top seed Jeffrey Goong of Bothell scored 264.80. INDIANAPOLIS (AP) — The girls’ swimming team at Carmel High School spent all season chasing records. On Saturday, the Greyhounds finally got the one that mattered most. 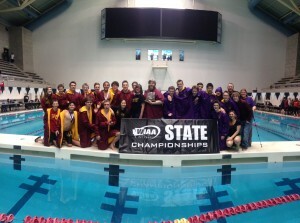 The team from the northern suburbs of Indianapolis won nine of 12 events at the state finals to cruise to a 30th consecutive state title and break a 30-year-old record for the longest championship streak by a high school team in any sport. The previous record belonged to the boys swim team at Honolulu’s Punahou High School, which was attended by President Barack Obama. The school won every state title from 1958-86. As usual, it wasn’t even close. The swimmers finished with 438 points and broke the record in style. Hamilton Southeastern, another school form Indy’s northern suburbs, finished second with 193½ points. Individually, the performances were just as dynamic. Olympic Trial qualifier Claire Adams won individual titles in the 100-yard freestyle and 100 backstroke as well the 200 medley relay and 400 freestyle relay. Adams finished her high school career by becoming the first female swimmer to capture 16 state titles — the most possible for any individual swimmer in the state. Teammate Veronica Burchill, also a senior and Olympic Trial qualifier, won the 100 butterfly in a state record time of 51.79 seconds and was just 0.09 seconds off of the national public school record in the event. She also had wins in the 200 medley as well as the 200 and 400 free relays. She captured 15 state titles to finish second to Adams in the all-time standings. And Plumb took home his 10th state title. The previous mark belonged to Tony Young, who also had a hand in the Carmel dynasty.